When I wrote my last post on March 16, I had just crossed the Delaware border and was in Denton, Maryland. Today, I’m in Kent Narrows, and I plan to cross the Chesapeake Bay Bridge tomorrow. The past five days have brought both joys and challenges. After posting my last blog entry on the 16th, I explored Denton, the seat of Caroline County, named for Caroline Calvert Eden, the wife of Maryland’s last colonial governor and sister of the last Lord Baltimore. I stopped to tour The Foundry — the name refers to the occupation of an early inhabitant — now a gallery showcasing the work of local artists. I was struck by the talent displayed in numerous pieces paying homage to the natural beauty of Maryland’s Eastern Shore. 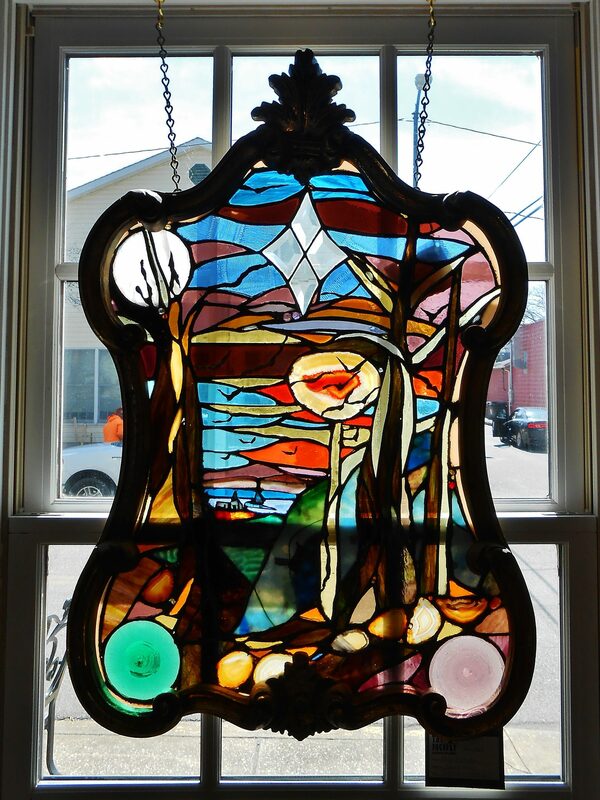 My favorite was “Gracious Spendor,” a stained glass work set in a re-purposed mirror frame. How many of our artistic creations — even in urban museums — rely on nature’s innate artistry! 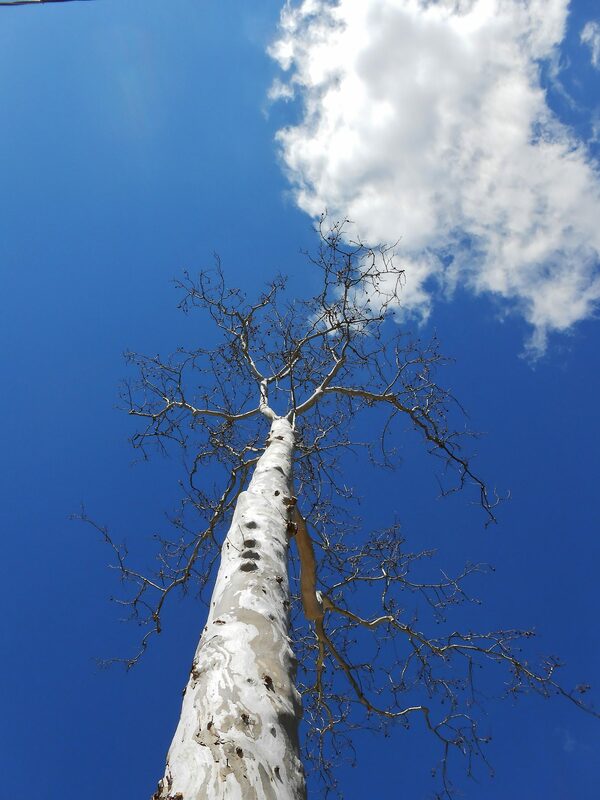 And in front of the Caroline County Courthouse, a sycamore tree, bare branches flung against blue sky, brought a touch of the wild into the center of town. On the 17th, after attending Sunday services at the Denton Wayside Church with the Weaber family — my hosts for the previous four nights — I strapped on my pack and hiked westward from Denton. 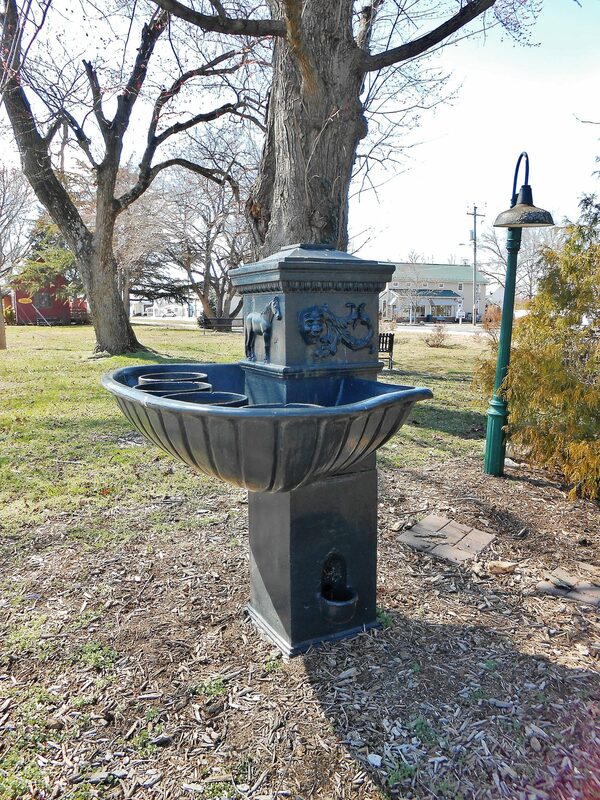 I soon came to the next small town, Ridgely, known for its multi-species cast-iron drinking fountain, with the top level for humans, the middle level for horses, and dog drinking bowls at the base. It was the product of a 1914 fundraising drive by the young women and girls of Ridgely “in the name of love and mercy toward all of God’s creatures.” No doubt the local birds made good use of the fountain as well. Toward evening, I arrived in Tuckahoe State Park, where there is a simple three-sided shelter set aside for American Discovery Trail hikers. There, I received two gifts. When I walked to a dock on Tuckahoe Lake to rinse my hiking pants, the light and wind conditions were just right to produce a remarkable spectacle. The trunks of trees along the shore reflected off the smooth but slowly undulating surface of the water, creating an illusion: a grove of serpentine aquatic creatures, writhing endlessly upward in a vain attempt to escape the confines of the lake. I didn’t have my camera with me, but even if I had, a still photo would not have captured the eerie effect. The second gift was of a more practical nature. A man who lives near the park had stopped to talk briefly with me when I arrived. Much to my surprise and delight, he later reappeared at the ADT shelter with a plate of corned beef, cabbage, and potatoes in honor of Saint Patrick’s Day! The food was a real treat as the chill of night descended, far better than the sandwich I had intended for my supper. I spent much of the next day, March 18, hiking through rural territory. My passage was apparently a big event for a herd of cows, who ambled over to their pasture’s fence to stare at me as I went by. Seeing a walker on the road is probably a very rare thing for them; most people whiz by in vehicles. 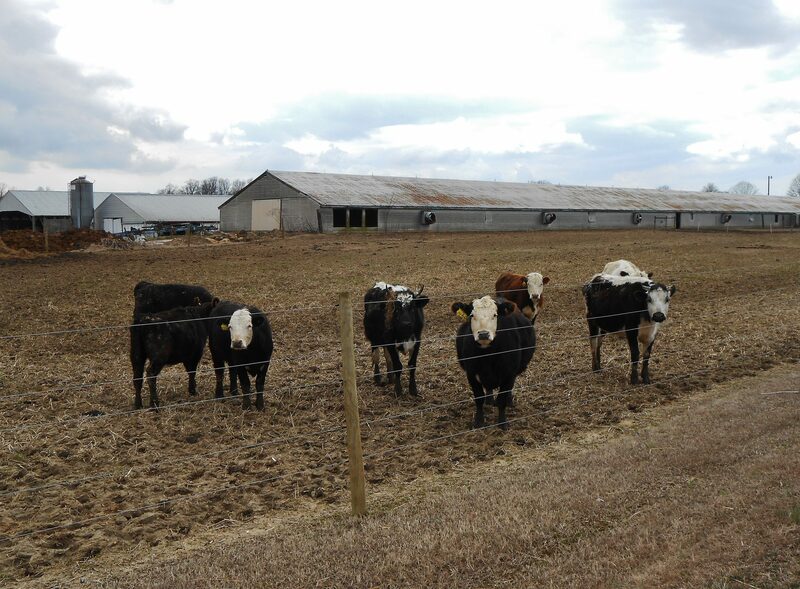 March 18: My passage entertained the local cows. By late afternoon, I began to wonder where I could spend the night. There were no parks, campgrounds, or motels nearby, so I considered asking a local farmer for a place to pitch my tent. The sign announcing one farm looked friendly: it read “Schillinger’s Farm / 5 Generations,” with a picture of mallards in flight, several happy-looking dogs (no doubt trained for bird hunting), and a pleasant background of green fields and golden sky. I was about to start up the driveway when I spotted a stern “no trespassing” notice. A bit farther down the road, the sign for Chestnut Manor Farms provided a phone number, which I called. As it turned out, the place houses a bird and deer hunting guide service. The owner was away, and without his permission, the man who answered the phone felt he could not allow me to camp or even use the bathroom. Next I tried, with some trepidation, knocking on the door of a small house across the road. 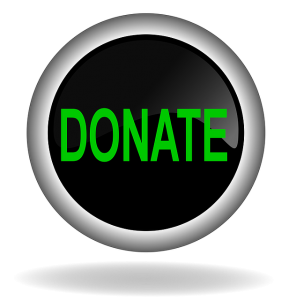 I had never in my life asked a total stranger — other than a commercial service provider — to meet my basic needs, and I felt uneasy about doing so now. When the door opened, I introduced myself to a friendly retired couple who told me they had had helped ADT hikers in the past. First, they allowed me to use their bathroom. This was no small thing: as a denizen of Maine’s northern forest, I’m well versed in the proper leave-no-trace protocols for “going in the woods,” but in an area dominated by fenced-in fields of private farms, options are few and far between. Then, the couple got permission for me to camp in the yard of a friend whose house was a few miles farther along the trail and who happened to be away. They provided me with a note, in case the man watching the house questioned my right to camp there: “This lady has permission to stay in the yard tonight…She is walking the American Discovery Trail, is an MD and has a PhD and is NOT homeless.” Which got me to thinking…If I were homeless, what would I have done? My need for a place to relieve myself and to sleep would not have been any less urgent. I found my home-for-the-night just before sunset, and got into my sleeping bag as quickly as possible, dressed in the warmest clothing I had brought. With all the electronic devices I need in order to write along the way — my laptop in a bulky waterproof case, a solar charger, and assorted cords, plus my phone and camera — I have no room for a heavy winter bag or tent. It got cold enough that the ground and my backpack were covered with frost when I awoke on the morning of the 19th. I packed up and trudged onward. In the cold, the quality of my sleep had been less than ideal, and my knees — which I mentioned as a developing issue in my last post — were growing more problematic from the repetitive stress of walking on hard pavement. My first tangible sign that I was nearing Chesapeake Bay came when I inhaled a strong whiff of the sea from a creek as I passed through Queenstown. Another, less pleasant, sign was an increase in vehicle traffic, funneling in toward, and fanning out from, the Chesapeake Bay Bridge. Which leads me to one of the major observations from my journey so far: our nation’s road system is generally not pedestrian-friendly. For significant stretches of my trek, I’ve had to walk along roads with narrow shoulders or no shoulders at all, with no place to get out of the way of passing vehicles except a narrow trash-strewn strip of dirt or a garbage-filled ditch. At highway crossings, I’ve had to wait for a brief lull in traffic, then hurry across as trucks barreled toward me. For the owners of homes along these roads, a leisurely family stroll from their doorstep would be out of the question, and attempting to walk or bike to nearby stores would be a dangerous undertaking. Meanwhile, personal vehicles are warming our climate, and all the ills that come from sedentary lifestyles — obesity, diabetes, heart disease — are on the rise. But even on busy highways, I’ve managed to find some scattered fragments of wild beauty. 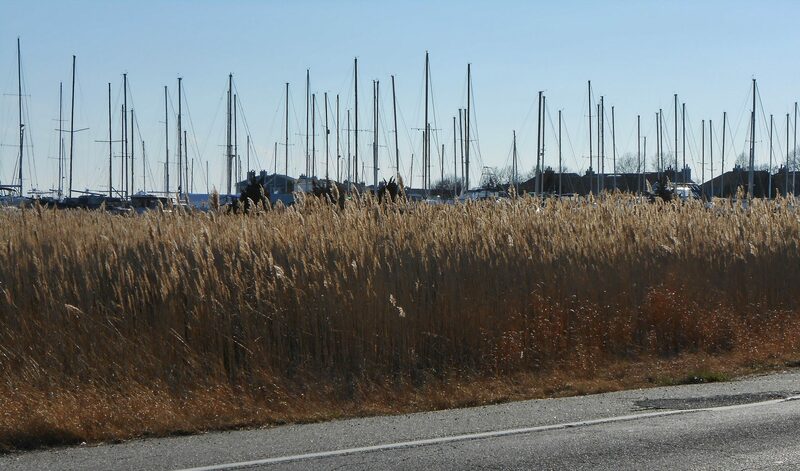 As I entered Kent Narrows, about five miles from the Chesapeake Bay Bridge, the afternoon sun shining through roadside reeds caught my eye. March 19 : Afternoon sun shining through reeds along Maryland Route 18 in Kent Narrows. The masts of sailboats rise in the background. Between the heavy road traffic and my increasingly painful knees, I was relieved to reach the Best Western in Kent Narrows, where I had reserved a room. To some extent, I had been ignoring my discomfort as I focused on reaching my goal. To my surprise, when I took off my pack, I found it difficult just to hobble slowly around my room. I had planned to take the 20th as a day to rest, do laundry, and write. Mostly, I ended up focusing on my knees. As I mentioned in my last post, I knew my ligaments were scarred from horseback riding, but after successful therapy, I’ve been almost pain-free for nearly twenty years. I’ve climbed Maine’s notoriously rugged trails up many a mountain, and I’ve negotiated challenging canoe portages with no issues. Those trails were difficult by many standards, but I was walking on the natural surfaces for which my body is designed. For me, a key difference with the ADT, at least along its easternmost portion, seems to be its hard, unnatural surfaces. So I’ve stayed on in Kent Narrows an extra day — not a terrible hardship given the chilly pouring rain outside. I’ve bought a second knee brace (I bought the first in Denton) as well as gel insoles for my hiking boots. I’ve iced my knees repeatedly and switched from naproxen to ibuprofen, which seems to work a bit better for me. 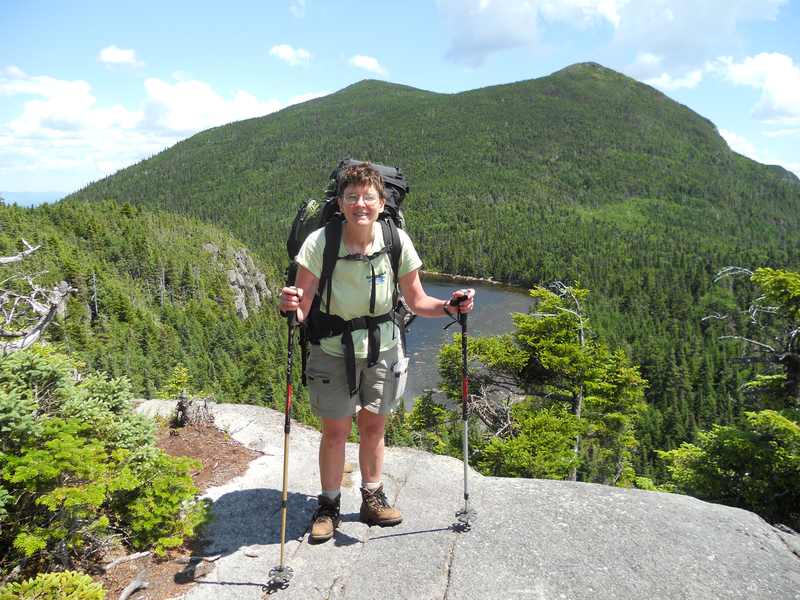 A physician friend got a “curbside consult” from an emergency doctor, who suggested I take more frequent breaks while hiking and avoid overextending my knees when stepping forward. Tomorrow I’ll try walking the five miles to the Chesapeake Bay Bridge and see how it goes. My next steps — literally and figuratively — are uncertain at this point. What is certain is that my journey will continue, even though some modifications will be necessary. Such is the nature of adventures! My first inclination was to try to push through the pain. I had committed to hiking every step from the Delaware shore to West Virginia, and that was that. But then I recalled the wisdom of my classmate, professional coach, and longtime friend Caroline Miller, who wrote the book on grit (her latest book, “Getting Grit,” came out in 2017). She stresses that not all forms of grit are admirable. She defines “stupid grit” as “the obstinate pursuit of a long-term goal that presents more negatives than positives because circumstances have changed.” An example she gives of stupid grit is “what happens when athletes play through pain and ruin their careers,” which seems particularly applicable to my current situation (though I wouldn’t classify myself as an athlete). My larger goal is not merely to hike, but to guide people into deeper connection with nature, for our own health and the health of the Earth. Respecting and caring for our own bodies goes hand in hand with respectful stewardship of the planet. And when I began this journey, I chose to accept all the experiences of the trail — whether they were joyful and beautiful, or challenging and uncomfortable — as opportunities to learn and grow. Perhaps a slower pace over the next few days will allow me to engage more deeply with people I meet — which, in the end, may be more important for me than covering every single mile of asphalt.